Available from online vendors so I will not be posting a sample. Presented here to share the cover art and Billboard reviews. Lush package production includes a gloss wrap-around book-fold jacket with color interior printing. From Billboard - April 20, 1959: While Williams (Hank Williams) is the example par excellence (referring to estate record royalties and strong sales for MGM), he is by no means the only artist to have sold consistently and who still sells. 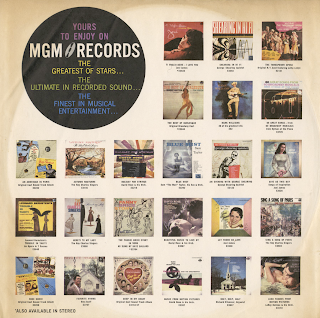 Joni James, with 18 albums to her credit, is MGM's "album queen." Even when she was going thru a singles slump, her album product move steadily. Some measure of how the firm regards her sales consistency is seen in the effort going into a new de luxe album package, "100 Strings and Joni," the recording of her Carnegie Hall concert. 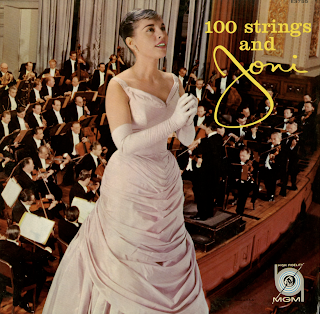 From Billboard - April 27, 1959: This handsomely packaged double-fold album spotlights Acquaviva's lush backing (recorded in England with 100 strings) behind the thrush's distinctive piping. 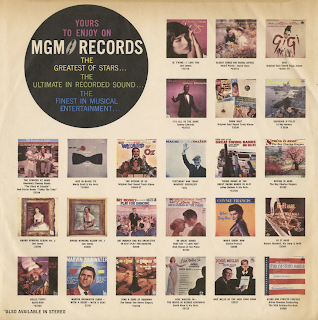 Romantic standard selections include "Imagination," "Body And Soul," "My Heart Tells Me," etc. A strong sales entry. James was married to Acquaviva when this package was produced.